It was Sunday morning, I was enjoying my hot ginger tea and the early morning sunshine when I phone notification rang. Usually it would have gone unnoticed (like other 2000 unread SMS I have in my Inbox), but I was not so lucky this time, as I was fiddling with the phone. The message was from the guy who cleans my car every morning. I was a little surprised reading the SMS, as it was written in english, up until that point I wasn’t aware that he reads or write english. Pretty lame of me, stereotyping a person based on his job role. Bemused I finished reading the SMS, and noticed few things which were perfect. I realised how this person’s communication was better than average tech geek. Before I go any further, I present to you, the SMS ad verbum. Qualities of his communication skills, that we can learn from. He didn’t made an assumption that I would have his contact details stored in my phone. He started with the most important point first, his introduction, allowing me to get interested in knowing who he was so that I can read the remainder of the message. Immediately after the introduction, he dives right to the point. He starts with the most central part of his communication. He is not going to come for washing the car today. He gave an explanation right after but he didn’t beat around the bush to convey to me the uncomfortable part of the news. I see myself getting irritated when our maids or staff go AWOL. They often don’t bother to inform and hence there is often no expectation that they would be communicating their absence for a fear of reprisal. Irrespective of the possible outcome, he chose to do the right thing. He communicated. 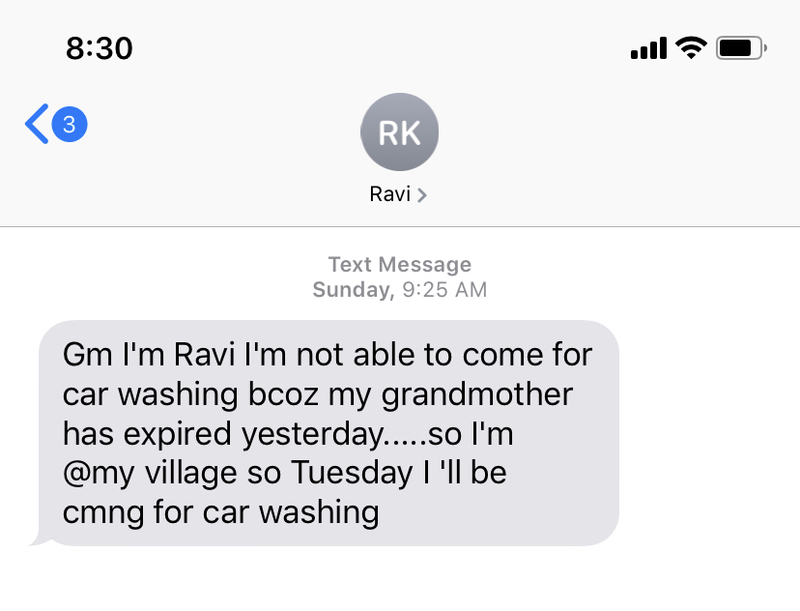 Since he was delivering an unpleasant news about the broken promise (a contract to clean the car daily), he made sure to let me know when will he make up for it. He provide specifics about his availability (he mentions Tuesday) to cover for his absence today. Which is obviously the next important thing for a customer when you delay a delivery. Leaving aside the fact that I have stopped counting how many times his grandparents have left this jolly world in last 5 years, I probably stopped counting after the 3rd such communication. I loved the details and thought put into making this small message and the lessons it have for all of such to improve our own communication skills.